How to get out of the doldrums? But with the change, everything is looking very dirty and dreary. I know it has to get ugly before it gets pretty. I have been in a slump these past couple of weeks. I have managed to waste a boatload of time. I could finish a whole bunch of projects that have been left undone, for years! Yes, years! They aren’t artwork, but refinishing a Hoosier, reupholstering a chair I don’t want to get rid of, painting our bedroom, and so on. I waited long enough though, and those urges left. Thank goodness. I did try to start a new fabric piece, but couldn’t make up my mind what to do. I looked through fabric, looked at photos for inspiration, but nothing jumped out at me. I enjoyed going through the references though. I still couldn’t get myself to actually start creating. I wandered through the house, sort of searching for something to move me. It just wasn’t happening! I started feeling guilty about the time I wasted and thought about what I should have/could have been doing. Well, that wasn’t extremely helpful, as you can imagine! I finally thought, maybe if I do something simple, something that doesn’t require a massive amount of planning, I could get myself moving. 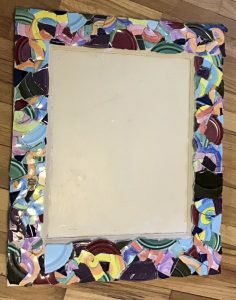 I went into the spare bedroom (my studio for mosaics) and looked at all the plates, cups, bits and pieces in all the bins. I hadn’t done a mosaic for at least a year, I think. I found an old cabinet door stashed with other art and decided I would give it a try. I would make the door into a mirror. That is to say, I would mosaic the outer BORDERS of the door, and place a mirror in the center part. It didn’t take long to get me going. I enjoy the process of looking through all my goodies, dishes I had forgotten about, deciding what colors I would use. My sister gave me a vase that used to sit in her daughter’s bathroom. I have always liked it. It had light bright colors and lots of swirls and curls. I would make it the focus of the mirror. I took a hammer and hit it. It cracked into several pieces and I was back in the saddle. Yay! Working on a mosaic feels much like trying to work a puzzle. (which oddly, I am not a big fan of normally) I do not like crossword, jigsaw puzzles or sudokus. But mosaicking is very relaxing and satisfying. I created a pattern from the colored swirls and quickly got into a groove. I found myself not wanting to stop at the end of the day. That is always a good feeling! The week went by quickly, and I did not have enough time to stay at the work. I did, however make time this past weekend and finished the gluing. 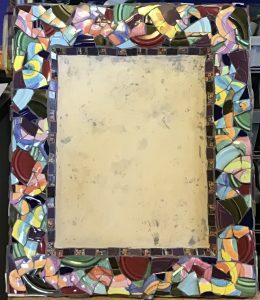 I am now ready to grout it and polish the mosaic. The grout really completes the work, as you can in the before and after pictures. Amazing. There are times in everyone’s life when things are boring, not motivating, we feel lost, unsure of what to do…. When I cannot get myself to make art, I worry that it has all dried up and there isn’t any more talent left inside of me. I panic, thinking I am done for. It is all gone. What will I do if it doesn’t come back? I took a short class this past Saturday; only 2 hours. It was Needle Felted Landscapes. It was crazy fun! I have never done anything like that before. I was nervous of course, but Lisa, the instructor, made us all feel comfortable and helped us to get moving. It was wonderful and inspirational. I am telling you this because it is another way to get out of the doldrums, and change directions. It helped me get excited about making art again. It might not help every time I am in the dumps, but it did this time. I guess what I had was an artist’s block, like writer’s block. The creative juices are still here. They just got clogged for a bit. I look forward to making more art. Spring is here, and I just might have a new spring in my step! ANOTHER THOUGHT, MAYBE WHAT IS NEEDED TO GET RESTARTED – HIT SOMETHING WITH A HAMMER. We might recall asking this when baking cookies or a cake with a parent. I am sure you can imagine using that phrase in many different situations. This month’s blog will continue to focus on art and not cookies, although I wouldn’t mind having a few right now. But that is another problem. How do you know when the painting, sculpture, fiber art, etc. is done, if you don’t have a recipe, or pattern to follow? Students ask me all the time. It’s a subjective question and answer. Is it done when you run out of paint? Or is it when there isn’t any more white space showing? Is it done when you can’t include any more details? Is it done when you have made your work look like it is a copied photograph? In order for me to know when I am done, I need to know what my destination is before I ever begin. How can I relay my message in the simplest way? Am I accomplishing what I set out to do? I ask myself this throughout the whole process of creating an artwork. Unfortunately, there is no cut and dry answer to the question. It is like taking a trip; you have to have a destination and a route to know if you have gotten there. Sometimes it is fun to not have a plan and just let things happen. That doesn’t usually work for me though, so I like to know my intentions at the get go. I would consider myself more of an impressionist artist than a realist. I do not like when I get bogged down with too many details. I do not believe it necessary to include every blade of grass or ripple in the water to convince the viewer that they are looking at a landscape. If I paint or draw two lines vertically and make them not perfectly straight, and then include a few lines reaching out to the sides from those vertical lines, you may see something that could resemble a tree. If the viewer knows what a birch tree looks like, do I really need to put every single notch in the tree or make sure I include every single black/grey bit in the bark? My answer is an emphatic NO! I have to leave something to the imagination. I want to let the viewer fill in the blanks. Most artists, especially new artists or those who work only occasionally, tend to work too long. Often, less experienced artists believe they have to show every last detail so the viewer knows for sure what they are seeing. This concept has driven many an artist to knives, and scissors. (not for use on themselves!) I cannot say this enough! Including all the details, will NOT tell you your work is done. It doesn’t always improve a work or make it more DONE. This is one reason I love painting with fabric. Not only does pattern and color play into the imagination as people look at my work, but they are forced to look closer to understand what they are seeing. No, I am not an abstract artist, but when I get it right, people will see things I didn’t intend to put into the piece. They see impressions of all sorts of things. I consider my work done when I leave enough not done. I hope that makes sense. I am not always successful at knowing when to stop. If I look at some of my past work, I can definitely see that I should have stopped sooner than I did. 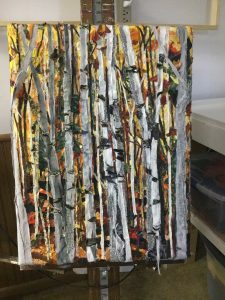 I am working on a fabric painting of birch trees and I have been for some time already. I have gone way too far in the details of the trees and I am very unhappy the way it looks. I should not have made so many tree shapes, all of similar sizes. I have torn off pieces and added other pieces, thinking I was fixing things and making it look better. I only have made it worse. I was trying too hard! When I started this painting, I intended to create a background of Fall colors, giving the impression that the sun was shining through the trees. I am sure you can picture it in your mind without any help. Because I over worked the Birches, I see only messy disheveled blobs of fabric. I kept changing my mind about what was the main subject and what I wanted it to look like. I lost sight of my destination. I can usually tell when a painting is not going well because every step seems difficult. All artists , no matter what level or medium, reach a point of no return on some work. When it is time to tear up the paper, rip up the canvas, dump the glued fabric and just start over. Like most people, I am not a fan of failure, but you know that old saying, “We learn most from our mistakes.” I admit it, it is true. So here is the question again. When is it done? When I can stare at my work for ten minutes and be pleased with what I see without wanting to change anything! Where do you make your art? When people ask me what I do for a living, and I tell them I am an artist, they often say, oh do you have a studio and is it open for visiting? Well, I have a “studio”. A room in my basement and a spare bedroom. Not exactly visitor friendly, but it is “my studio”. The idea of an artist’s studio sounds so glamorous and romantic. I would stand around in a smock, wear a beret, and hold paint brushes and a martini in my hand at the same time. Nice thought, but since I don’t live in a movie it is anything but glamorous. I have a basement room in our house, that is filled with fabric in one section and stained glass and supplies in another. The spare bedroom is filled with shelves of mosaics, dishes, cups and more. I generally wear clothes that have paint and glue or grout on them and I don’t drink martinis. At least not during working hours! Every once in a while, I come across an article or magazine about artist studios. They do indeed look pretty dramatic, so organized, and aesthetically appealing. Looking at the photos makes me feel jealous and envious of the beautiful working space. I sometimes think, “Oh if I had a space like that, I would be able to create so much more and be inspired to be adventurous. Maybe some artists do have those beautiful studios, but it doesn’t make them more successful. When you make art, it doesn’t matter where you do it. If you only have a dining room table, then that is where you make your art. Sure, it would be nice to have a big space, but if you don’t, you do with what you have. We cannot use a lack of space as an excuse for not making art. Your art may be limited in size by where you work, but you can still do it! When I started creating art, I did only have a dining room table. As our living arrangements changed, though, I managed to get a bit more space with each move. It has always worked out somehow. I dream of having a big beautiful art studio, however, based on my history and the future, which of course I cannot see, I am just guessing I will continue to learn contentment working in my basement! At least I don’t have a commute to go to work! Do you enjoy teaching or making art more? I just completed a private class for 2 days. It was such a fun and exciting class and the response from the 2 women was fantastic! It was the first time students created on a larger surface and for more than one day. Each one did an amazing job of making their idea come to fruition. I was really pumped from that class. Whenever I teach, I always have a knot in my stomach before class starts. I associate it with stage fright. It does not feel good! I know I am prepared, yet it happens every time I teach. It is always for naught. I relax in a few minutes after starting, and I am successful. Of course, there are times when I think I am not explaining a technique clearly enough, or when students struggle through each step. Teaching is very satisfying for me, though. I especially enjoy when students are immersed in their work and “get it’. I would guess that teachers of all kinds have the same feelings when the lightbulb goes on for students. I have been blessed by the number of students who have taken my classes! It is impossible to make a choice between teaching and creating. I can squirrel up in my studio and get lost in the process, quite easily. I like the solitude and the freedom to move at my own pace. Most often, I stare at my work more than I am actually “creating”. I always thought the only way I could thrive was being around people. The interaction with the world fed me, excited me, and nurtured me. I thought I could not work alone. When I stopped working at the coffee house, I struggled with the silence. How could I get anything done? What was feeding me? Who would I interact with? What would motivate me? What good is being alone and not interacting with others? I know some of you are laughing at that statement because I am such a chatterbox! It’s strange though, I cannot do serious artwork in a group setting. When I finally surrendered to the stillness, I discovered it was quite nice! I became comfortable being with myself. I discovered how to enjoy the “me time”. I am very fortunate to have such a supportive husband who encourages me to be creative. I work for several days at a time when I don’t see anyone except Robin, and it is glorious. Then, I begin to feel lonely. I know it is time to step out into the world again and interact with people. It doesn’t have to be a class, but I need to spend some time talking with people. I am a social butterfly and enjoy the company of others. I am fed and charged when I have opportunities to be with friends. Teaching fills that need and although I know students are rewarded from taking a class, I often think I get more from it than they do. The bottom line is this: I need both teaching and creating time. I am content working alone, and I am inspired when I am teaching, because I really do love to see and hear what other people are thinking about and to see their ideas! The satisfaction I feel when going home after teaching a class is wonderful. I am always tired, but the gratification I feel is always similar to the “buzz” of finishing a painting. It is just “delightful”. I was traveling to Chicago yesterday to visit my daughter and my grandson. As I was waiting to be picked up by my son-in-law, I was watching people. It’s fun to people watch. There certainly are a bunch of different kinds of people. Tall, short, thin, fat, in between. Happy, sad, depressed, irritated, and even angry travelers were seen. The one thing that stuck out though, was how everyone was in such a hurry! Where are we all going in such a hurry? I mean ultimately, will it really matter tomorrow? It’s November! Halfway through actually. The year is almost over. What happened to all the time in the year? I know we’re all supposed to have the same amount of it, if we are still breathing, that is, but I think I was shorted a few weeks! In truth, I think I wasted those weeks, spread out over the entire year. But we will consider that later. We associate November as a month of thanks, which is a good thing. I think most of us humans forget to be thankful most of the time. I know I do! I am going to touch on that subject, in relation to art. This may read like a Hallmark card, and if it is too sappy, you can be thankful that it isn’t longer than one page! I sometimes wonder how many people notice the colors of the day? It can be bright blue, with bright sunlight that casts shadows. The landscape by me has turned to browns, cream, dust, grey, and ochre (goldish). I love when the sky is dark with rich deep greys and various shades of it. I find it intriguing to see where the darkest shades are located in a cluster of clouds. Have you ever noticed the shapes of the trees without leaves? I love seeing contorted weird shaped trees and see all the bending limbs. There is something so beautiful about the shapes and colors of trees! The different bark and textures. Do you ever notice the way the wind blows a flag? The rippling of the fabric reminds me of water. It’s so relaxing! I really like seeing the wind move things around. I especially like watching clothes blow on the clothesline. I don’t think it gets much simpler than that, but it is a gift. I love windy days. (yes, even when it is -10 or 15. How about the absolute beauty of frosted windows? Do you examine the intricacies of the shapes the ice has made on the window? Most people can’t wait until Summer again, but I, for one, relish all the subdued tones of the season. How about the sounds? No mowers, no leaf blowers or speeding, revved up trucks. Most birds are gone here in Minnesota, so I hear less sounds in nature. There is so much inspiration all around me though, I sometimes am overcome by the fact that there is not enough time to do all the art I want to create. And that brings me back to the time I lost in 2018. Starting an art piece is the most frightening in my process. How shall I start? What if it doesn’t turn out? I manage to waste time worrying, instead of starting. Like anything else in our lives, if we just take one step forward, we are that much closer to the next step. Sounds corny, I know, but it is the truth, like it or not. I think it best to just forget about the time I did waste! I think I will relish on what I DID get done, and how I have plenty to consider for 2019. Look at some of the simple things in your world, and really notice. I played with my grandson, Caleb all week long. I had to force myself to sit at his level and examine pinecones, and tiles, and sticks, and dryer fuzz. It is little. So little, and yet, each item in its own right, is interesting. What can I do with dryer fuzz? I don’t know, but I might come up with an answer! Stay tuned. I personally believe all of us are creative in some way. The definition of creative is- relating to or involving the imagination or original ideas. All of us are creative. It might not be in the usual forms, of say, painting, singing, dancing, writing, photography, knitting, crocheting, cooking, making furniture, or sewing, but maybe a person who is great with numbers has a very creative way to find answers to problems. What I am saying is, we all possess talents and gifts. It’s just that some are more obvious than others. It drives me crazy when students say to me that they don’t have any talent. When they say they can’t even draw a stick figure, my general comment is, “well, that’s good because we aren’t doing stick figures today!” Adults have this natural willingness to dismiss their talents because they rate themselves even before trying. We all do it. I love watching kids in the classroom when given the chance to be creative. They don’t need to be told how to be creative. Give them a piece of paper and a crayon and watch them go. Kids have no inhibitions. They don’t even know they are being creative. They are not worried about accuracy or shading, or depth perception, or is something the right color. It just comes naturally. If it is in us when we are young, it must still be in us now, as adults. It’s just that we have managed to push it so far down inside of us, that we forgot it was ever in us. I make art because it makes me feel good. Perhaps I can best explain myself by saying this. When I have not been in the studio making art, I get uptight, irritated and am generally a crabby person. I feel out of kilter. I have a yearning to be creative. I need to. If it goes on for more than a week for some reason, I have a gnawing in me. Often, my husband will say, “get in your studio, and make art.” Artists often say they get lost in the work, and hours can go by without them noticing. It’s true. I still think of being an artist as a luxury. It’s not luxurious making art, but it is such a gift to be able to do what fills my soul and makes me feel whole. I have an extremely supportive husband and he wants me to focus on my art life. I agree with that because you cannot please everyone, so why not please yourself and create from your heart, not what you think people want. It has almost never worked for me. When I am more concerned about what I think people will like than what I want to create, I usually fail. I am not happy and the work usually doesn’t sell. I am not an egocentric maniac, but I know for sure that if I create from my heart, it just works! I have done landscapes and waterscapes for several years. Whether I am working in watercolor, mosaic, or fabric, I have always used this topic. It is a relatively easy subject matter for me by now, and I am getting an “itch” to move on to another subject. I have begun working on people studies. Not portraits, but activities that people do. Reading a paper, dancing, etc. If you continue to visit my website, you will begin to see new subject matter. I will not leave landscapes or waterscapes completely, but they will take a back seat soon. Hopefully, I have not bored you to death and I have said something that you can agree or disagree with. If that is so, reply to this blog. I will look forward to reading what others think about my question. Why do you make art?